Thanks for your support on strike day 1! 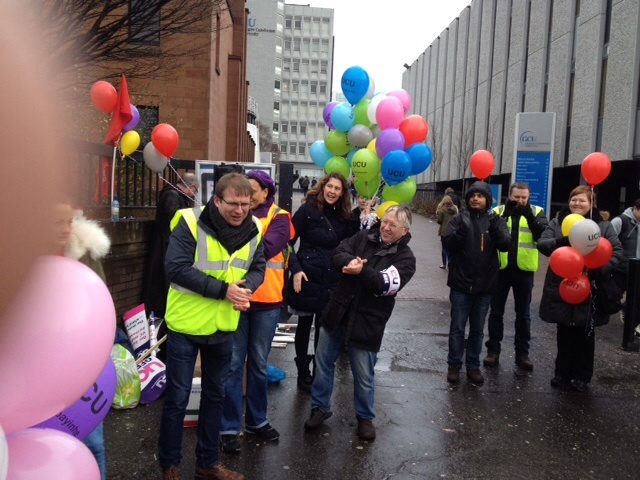 Although there was no doubt about the serious issues at stake, there was a carnival atmosphere on the picket line at GCU today, with inflatable balloons representing the gender pay gap, cupcakes, music, plus our usual gazebo, and of course, our incredibly talented members. In what was acknowledged as the best turn out in recent disputes, all the gates were covered, including incoming vehicles whose drivers were spoken to. We got tremendous support from other unions, including speakers at our gate side rally, and also support from the officers of the Students Association. 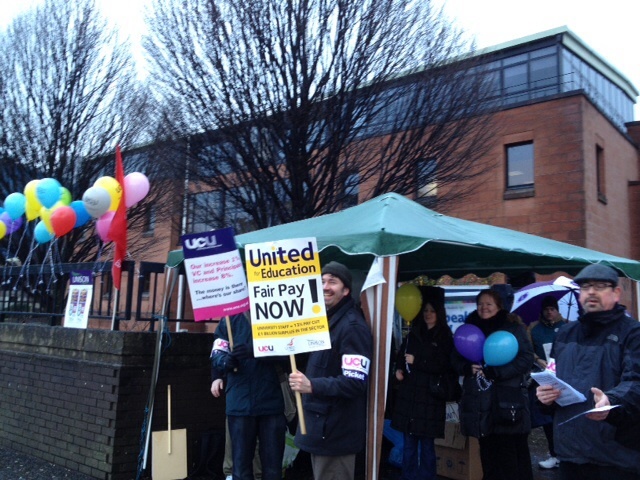 Members of the UCU Postgrad community were also out arguing for the end of casualised contracts. Fortunately better sense prevailed and no polis appeared, (but with that the chance for a brilliant photo-shoot also disappeared). More welcome on the picket line however, was one of the chefs from the kitchen delivering hot rolls commissioned and paid for by Unison@GCU. 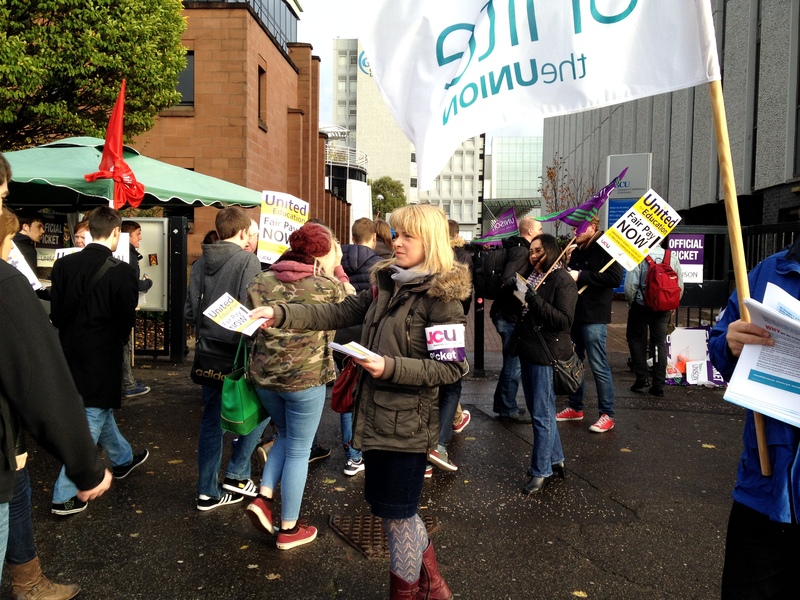 and following the end of activities at noon, there was a sizeable contingent from GCU UCU who joined staff from Glasgow university, Strathclyde, College of Art, and UWS. Speakers at the rally were myself for UCU Scotland, Helen Martin from the STUC, Rob Henthorne from NUS Scotland, Anna Ritchie-Allan from Close the Gap. Messages of support were also sent from Unite, EIS and others. 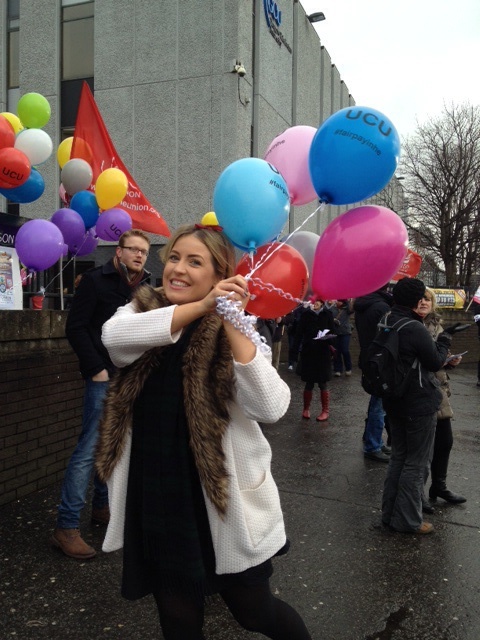 A new generation of pickets has been born…..
And it was a great atmosphere all round. This entry was posted in EIS, UCU, Unison and tagged Douglas Chalmers, strike, Students, UCU, Unison on May 25, 2016 by unionadmin. Following the failure of the University and Colleges Employers Association (UCEA) to offer an increased pay offer to university staff, Glasgow Caledonian University unions will be joining their colleagues throughout Scotland and South of the border in a further day’s strike on Tuesday 3rd December. 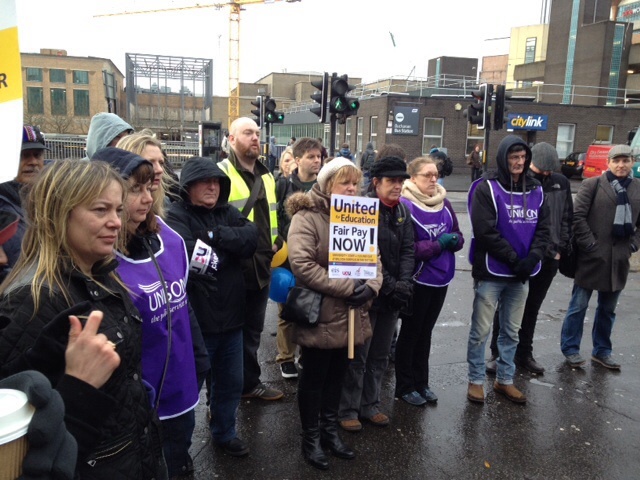 October 31st saw a tremendous turnout from staff from three of the four university unions, now to be joined by EIS on December 3rd. Universities are central to a modern forward looking society, but increasingly staff working within them are seeing their living standards being cut, at a time when universities have adequate reserves to pay decent salaries, and when principals are continuing to accept massive salary increases. Comparative figures between 2009 and 2012 show that in this period, the median pay for full time and casualised staff working as Higher Education teaching professionals has decreased by 2.27 percent in absolute terms to a median wage of £39,414. Over the same period, inflation has increased the cost of living by a cumulative 15.5 percent. Higher education teaching professionals are still paid significantly below comparably skilled professionals, including legal professional workers, marketing and sales directors, train and tram drivers, human resource managers and directors, IT specialist managers, health professionals, and police officers (sergeant and below). For a professional service to our students and to our communities, university employers need to ensure their staff are paid a professional salary. That’s why we will be on strike on December 3rd. This entry was posted in Combined Union Committee, EIS, Management, UCU, Unison, Unite and tagged EIS, Pamela Gillies, Salaries, Scotland's Future, strike, UCU, Unison, Unite on November 24, 2013 by unionadmin. Supported by GCU Combined Union Committee. 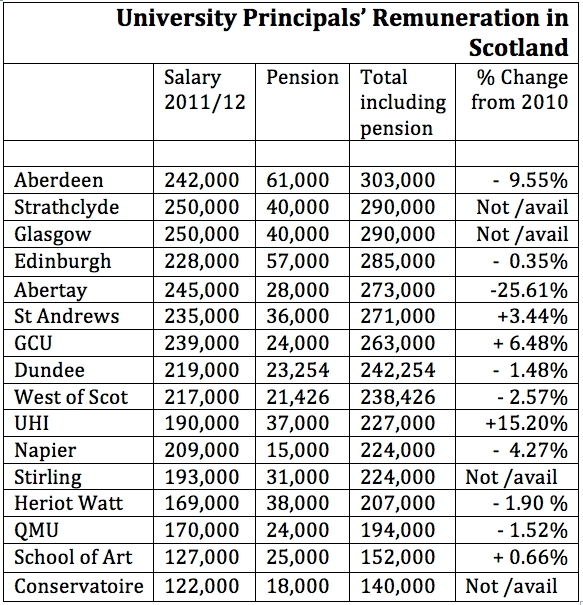 Higher education staff are worth it! This entry was posted in Combined Union Committee, Management, UCU, Uncategorized, Unison, Unite and tagged Combined Union Committee, Salaries, strike, UCU, Unison, Unite on October 25, 2013 by unionadmin. The success of Douglas Chalmers in a contested election, and Davena Rankin elected unopposed in the recent ballots for staff governors to the GCU court, is a sign that staff are backing the reforms in university Governance promoted by both candidates, according to Dr Nick McKerrell, chair of the Combined Union Committee at GCU. “I am proud to have been elected by my academic colleagues, on a clear platform of support for the recent Von Prondzynski proposals of reforming HE Governance. I think there is a clear understanding in the sector that the status quo is frankly not working, and indeed the tinkering with the status quo, which is currently being suggested by the chairs of Court does not answer the need for substantial change. I will be consulting widely within the university community regarding governance at GCU before my first Court meeting, and would encourage any member of academic staff – whether in a trade union or not – to get in touch if they have a point of view they would like to put to me on this. I think the fact that over two thirds of those voting – in a four person contest – voted for change is heartening – although the turnout of 14 percent shows the mountain that still needs climbed to convince staff that the court structure is a relevant part of governance at GCU. I hope to help do this over my term as governor”. This entry was posted in Combined Union Committee, Court, Management, UCU, Unison and tagged Combined Union Committee, Court, Davena Rankin, Douglas Chalmers, Governance on June 21, 2013 by unionadmin. The combined union committee comprising of UCU, EIS, Unison and Unite, have asked their members to vote for Douglas Chalmers for the vacant academic staff position on Court, in the elections this Thursday 13th June. This follows the news that Davena Rankin was elected unopposed as Support Staff representative. Thursday’s voting comes at a time when the Scottish government are expected to implement the findings of the commission into HE governance chaired by Professor Ferdinand Von Prondzynski which reported earlier in the year. This was extremely critical of the current functioning of existing university Court structures and called for widespread reform. Following this, the existing chairs of Court set up their own commission to draw up a code of conduct – a process which however excluded direct involvement of staff and student voice on their commission, in direct contradiction of the suggestions of Education minister Mike Russell. These court-led meetings were generally perceived to be shambolic – with no minutes taken and a widespread perception existing that this was essentially an undemocratic manoeuvre taken by the existing power structures within university courts, to defend their privileged nature. Douglas is for radical change in the way the Courts operate. Said Douglas Chalmers: “I am fully behind the implementation of the suggested reforms to Court functioning and governance. I have a proven track record of arguing for Courts to be more open to the voice of all staff and indeed the whole university community. I believe the chairs should be elected, the gender balance should be improved, the minutes published, and the presumption should be openness rather than the reverse. I hope all academic colleagues will support me in pushing for our university to follow in the direction of radical change and to become a beacon of good practice”. 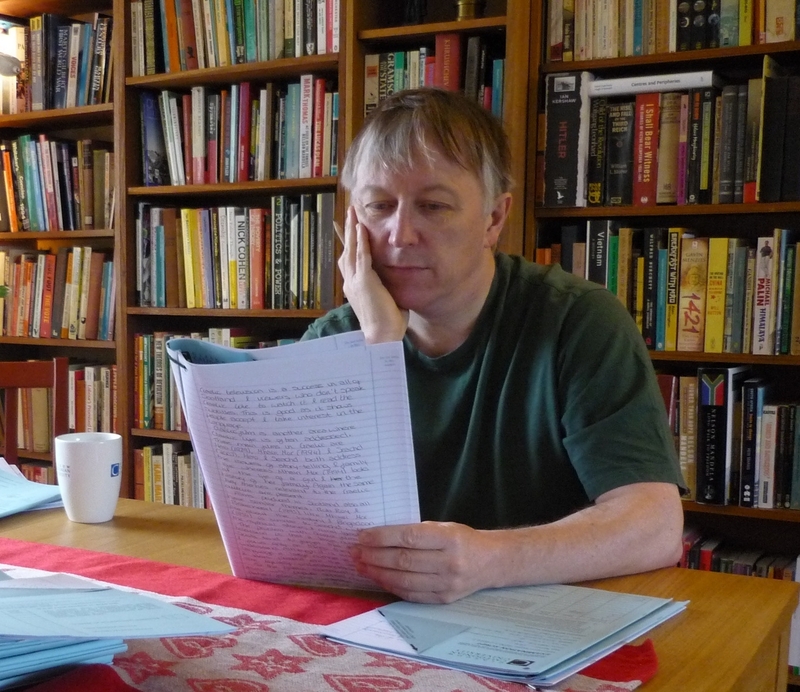 A short interview with Douglas on some of the relevant issues can be found here. Remember Thursday 13th June: Vote Douglas Chalmers for Academic Staff Representative. This entry was posted in Combined Union Committee, EIS, Governance, UCU, Unison, Unite and tagged Combined Union Committee, Davena Rankin, Douglas Chalmers on June 11, 2013 by unionadmin.